If you’re a B2B company, then you know just how important your people are to your company’s success. Don’t get us wrong—employees are an important part of every business, no matter the industry. Without good people who do their job and treat customers well, your business will not be successful. But in some cases for some B2B companies, especially those in the Services realm, your people are your product. You need to build the best team you can, or risk it all by having mediocre talent reflect poorly on your brand. As a B2B company looking to establish and grow your brand, you need to stand out from the crowd. You need to showcase your culture in unique ways and attract top-level talent by offering them something they can’t get anywhere else. What is something all of your employees do every single day without fail? Sometimes even on the weekends? You guessed it: they send email. A lot of email! On average, a single employee will send 10,000 emails per year. 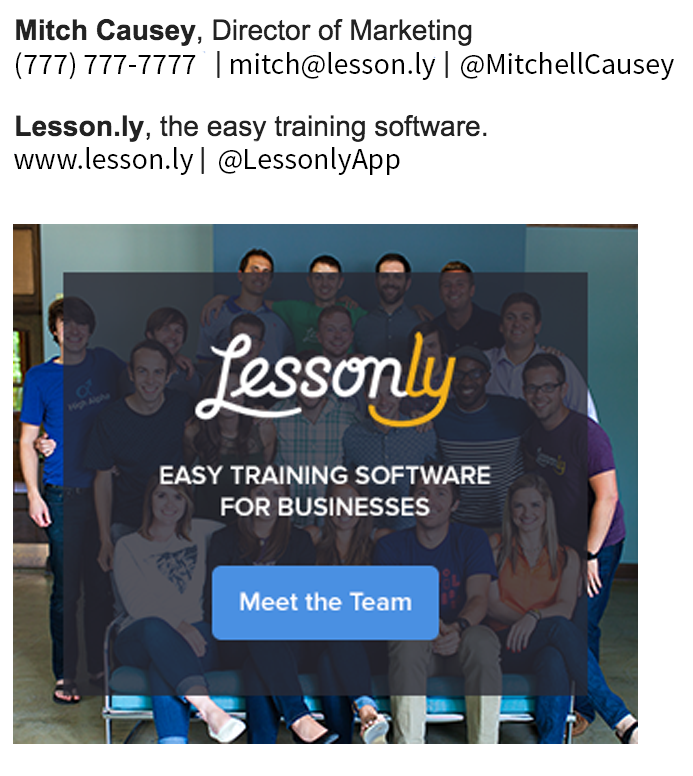 If your organization has just 100 employees, simple math suggests your company is sending one million emails per year! That’s a million brand impressions and engagement opportunities being sent out to your most important contacts—those your employees are emailing, which includes prospects, customers, partners, community members, and more. Every one of those one million emails can either be a positive or negative brand experience. And sometimes, especially for B2B companies, email and phone calls may be the only interactions your contacts will ever have with your employees. Every touchpoint matters to your brand’s integrity. 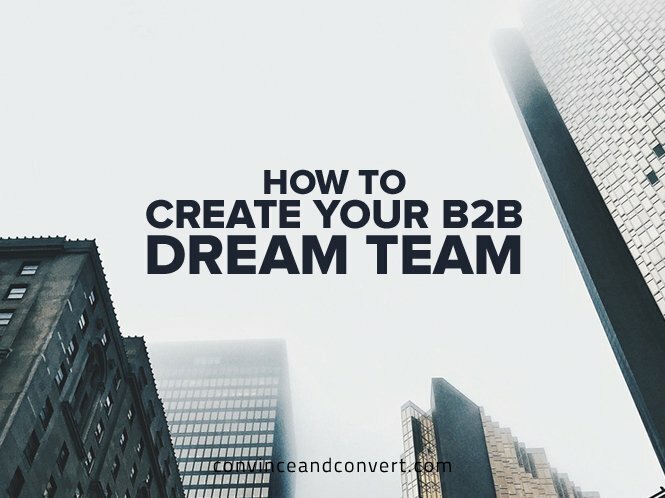 Why not use this high powered channel to attract your dream team? Email is a powerful engine for business services companies. Use it for your brand’s advantage. Here are a few examples of how your B2B brand can make the most of employee email signatures to promote your culture and attract your dream team. Do you have an amazing company culture where every opinion matters and every team member is expected to grow? Does your company have fun traditions, or does your team volunteer for service opportunities around your community? How about an awesome CEO that’s vocal about employee success? Use the email signature template as a way to highlight your team and the rewarding culture you’ve created by sharing a video from your CEO, a picture of the team, or stories about serving the community. Your company is always on the lookout for superstars, especially those that are already aware of your business and the unique services you offer. Why not use email signatures (which are already being viewed by your most important contacts: prospects, customers, partners, and community members) to drive awareness for specific open positions? Your employee emails are far-reaching, so include an email signature that incentivizes your contacts to refer their friends to open job positions. 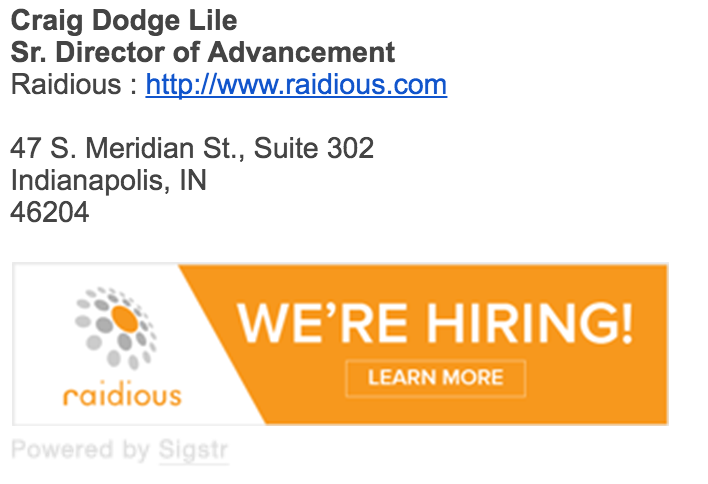 Point email recipients to a landing page where they can either browse the current job openings (like the Raidious email signature example above), or direct them to a landing page where they can nominate rockstars for your team—and get rewarded if their referral is hired! Sign up for Sigstr and start your free 30-day trial today to begin using the power of an email signature generator.